Why should we use Gantt Charts to Plan Projects? Why use Gantt charts? To successfully a project, you must control a large number of tasks and ensure that they’re completed on schedule. If you miss a deadline there could be drastic effects on the rest of the project. This may result in project delays and cost a lot more. That’s why it’s helpful to be able to see everything that needs to be done, and know, at a glance, when each activity needs to be completed. 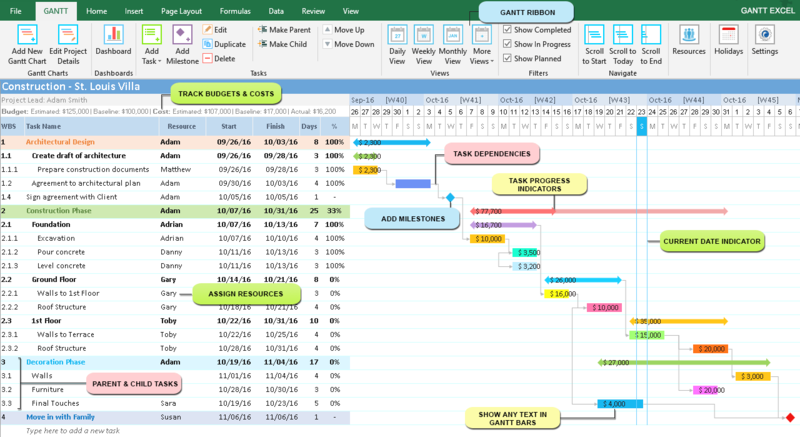 Gantt charts convey this information visually. They outline all of the tasks involved in a project, and their order, shown against a timescale. This gives you an instant overview of a project, its associated tasks and milestones, and when these need to be finished. When you set up a Gantt chart, you need to think through all of the tasks and milestones involved in your project. As part of this process, yaou’ll work out who will be responsible for each task, how long each task will take, and what problems your team may encounter. This detailed thinking helps you ensure that the schedule is workable, that the right people are assigned to each task, and that you have workarounds for potential problems before you start. They also help you work out practical aspects of a project, such as the minimum time it will take to deliver, and which tasks need to be completed before others can start. Plus, you can use them to identify the critical path – the sequence of tasks that must individually be completed on time if the whole project is to deliver on time. Finally, you can use them to keep your team and your sponsors informed of progress. Simply update the chart to show schedule changes and their implications, or use it to communicate that key tasks have been completed. To create one for your project, follow these crucial steps. Gantt charts don’t give useful information unless they include all of the tasks/ milestones needed for a project or project phase to be completed. So, to start, list all of the activities as tasks. Use a work breakdown structure if you need to establish what the tasks are. Life is full of milestones – and so are projects. When planning a project, aside from laying out the tasks , you’re inevitably going to want to mark key dates along the way. Milestones help your team stay on track and as a project manager to more accurately determine whether or not your project is on schedule. Key Dates – Launch parties, board meetings, product rollouts, program kickoff and other key dates mark significant milestones in your project. It’s also helpful to include other one-day events unrelated to your project specifically that are still important for your team to keep in mind – like a group offsite or team holiday. Key Deadlines – Key deadlines are important to surface on large project plans so your team can easily see what’s coming up and plan accordingly. For example, the date that website development is completed or when customer conference registrations need to be returned to qualify for early bird pricing. Key deadlines are related directly to your project but they aren’t project tasks. Use a key deadline as a milestone to reflect when a section of tasks or key task is completed. External Dates and Deliveries – For example, a due date for a deliverable you are expecting from an agency, the date when your hiring manager has received an offer letter, or the day that pipes are scheduled to be delivered. These key events can affect when other tasks in your project are allowed to start. They may also be used as predecessors in your plan. As your project moves along, it will evolve. For example, in our scenario, if quality assurance of core modules revealed a problem, then you may need to delay training, and halt development of the management information system until the issue is resolved. Update your chart to reflect changes as soon as they occur. This will help you to keep your plans, your team, and your sponsors up to date.